Mastered for <a href="http://www.discogs.com/label/Wallshaker+Music">Wallshaker Music</a>. Of the three Decoside releases thus far, Volume 1 is probably my favorite. It's easy to compare the releases now that Decoside has released a cdr compilation. ...Although I do really like Reload 3 and Disorder as well. Fantastic tracks! 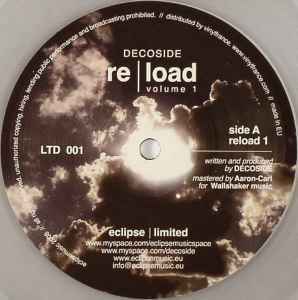 Reload 1 is an absolute stunner, a display of art with in art of coarse musically explained and my personal favorite on this wonderful 12"
The production style of the track uses very dry sounding landscape as if there's someone breathing over it unpredictably, with the traditional tap hissing element flowing in variable patterns. A bassline based on 3 injecting sounds following a 2/2 beat rhythm, some bongo loops with 1 solid high hat which remains constant throughout the tune. A really solid start for Giacomo Rondinella in his debut on Eclipsemusic and I hope there's lots more Dub Techno produced in this manner.